Are you guys all hanging in there with the sweltering heat? I feel like this is the best part of the year in Seattle, and Ideal weather for throwing a party! I hope you have a ton of fun plans and amazing menus that you are going to be cooking up over the next 6 weeks of Summer!!! Make a Rainbow Crudite Platter to start! Probably the cutest cocktail EVER, and definitely, without a doubt, the most fun. Also- they taste really good and will be DANGEROUS (in the best kind of ways!) for you and your friends. 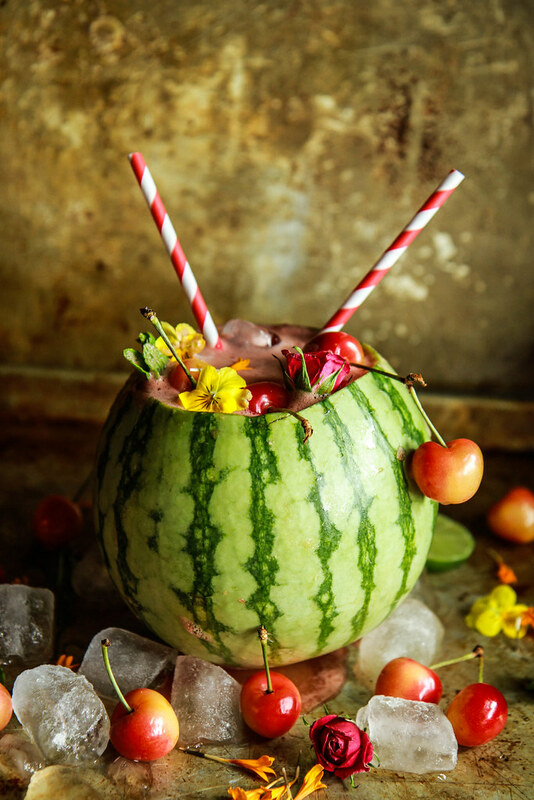 I recommend making the recipe (preferably in bulk) and putting it into a pitcher and then pouring them into the mini watermelons as though they were the guests glasses (obviously, you only get one watermelon each!!). Maybe they need nametags!? And then fill the mini watermelons with ice cubes and pour the heavenly tequila concoction over the ice. You can refill as needed! 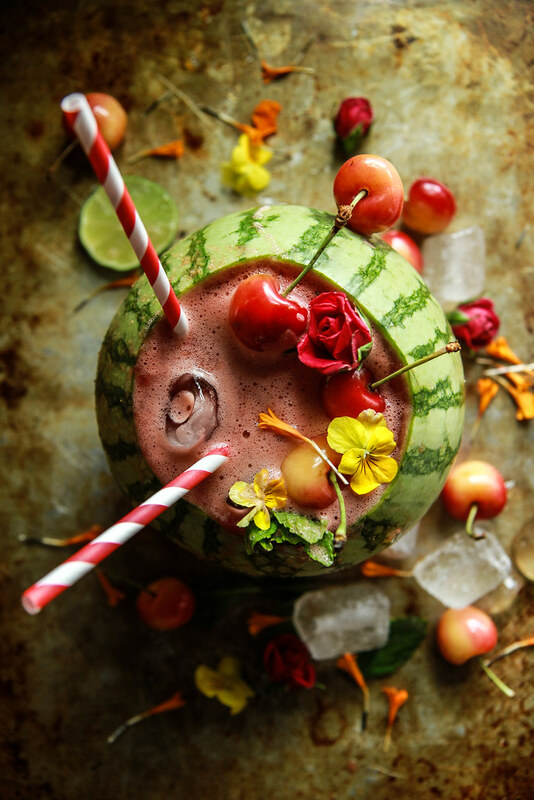 Combine the watermelon, limes, cherries, tequila and agave in a blender and puree on high until frothy. 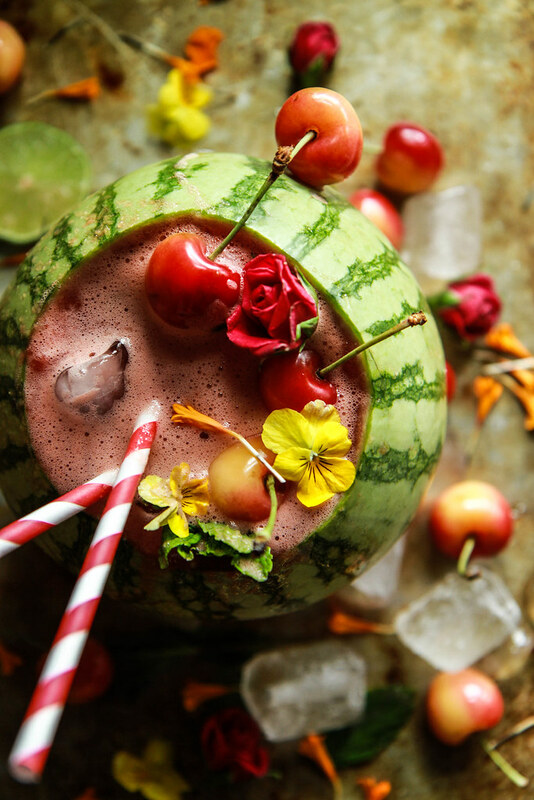 Pour into glasses or into a hollowed out mini watermelon and serve with ice cubes and fresh mint leaves. That is the only way to drink them Gerry! Is it wrong that I want to sleep this weekend? And chill, no plans? I’ll happily take this drink though. Shall I come over? NO- nothing wrong with that and YES! Come over anytime! Oh yes! This is most definitely dangerous and 100% happening this weekend!!! I’m going to make this for 4th of July – love this fresh cocktail! This looks amazing!! I love the idea of serving it in a watermelon! SO so pretty! I love that this is served in a mini watermelon! So fun! Thanks Erin! I love how cute those little melons are!! Now THIS is one epic cocktail! way too light on the tequila, 6 oz. minimum which is only a jigger per cup +. Great Wayne! I’m all for adding more! this cocktail is everything i this weekend!